The smell of this dish alone is to-die-for. The flavor is really the perfect mix of fresh ingredients. It tastes homemade, home-grown and is fabulous for summer entertaining. Even Peter, who is not a pesto-lover enjoyed this dish! As for the Nugget, he wouldn’t even look at it – but hey, he’s 8. He sticks to a diet that doesn’t involve things that are naturally green in color. 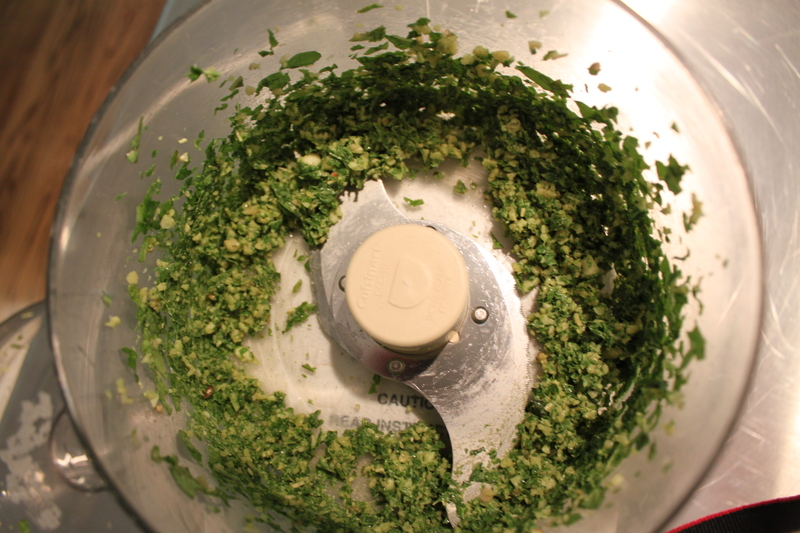 Start by putting the basil, garlic cloves, salt and pine nuts in the food processor. If you don’t have a food processor, a blender will do the trick. Blend these ingredients until finely chopped. Slowly add the oil and blend. Add the cheeses and blend again. This is heaven in a bowl! If you make too much, don’t worry about it. The pesto can be stored in the fridge for up to 2 days, and tastes amazing on sandwiches or anything else you can dream of. 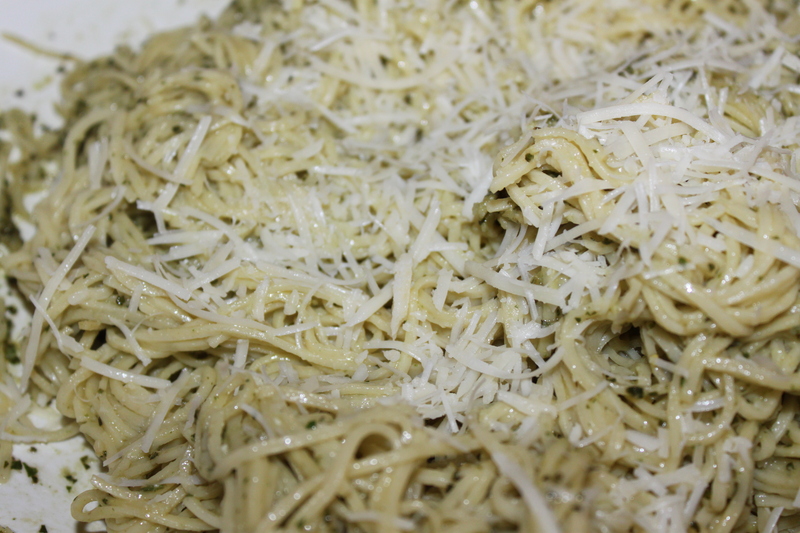 Prepare the pasta, and in a heated bowl, spread a little of the pesto. 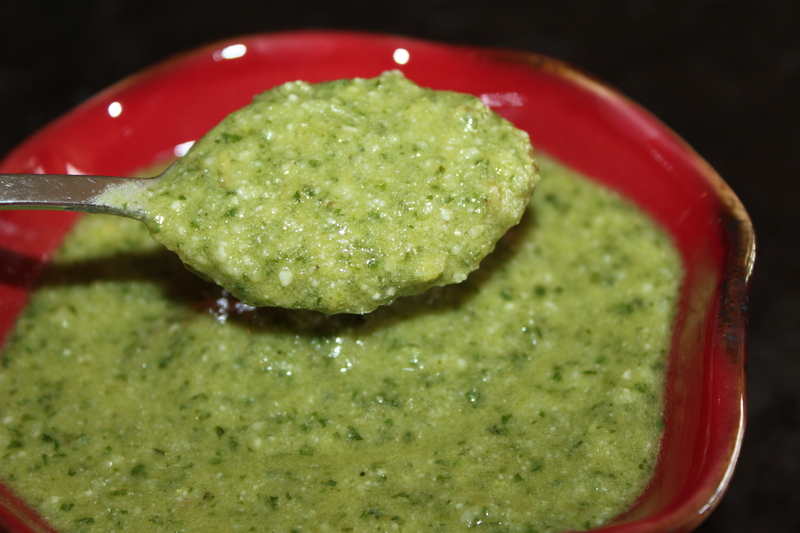 The warmth of the bowl will release the mouthwatering aroma of the fresh pesto. 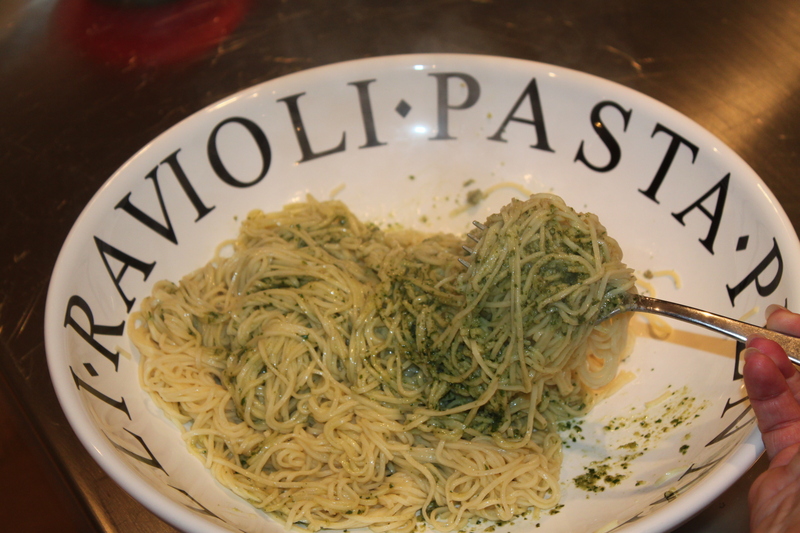 Place the warm pasta in the bowl and mix in the pesto. Add as much pesto to the pasta as you like. 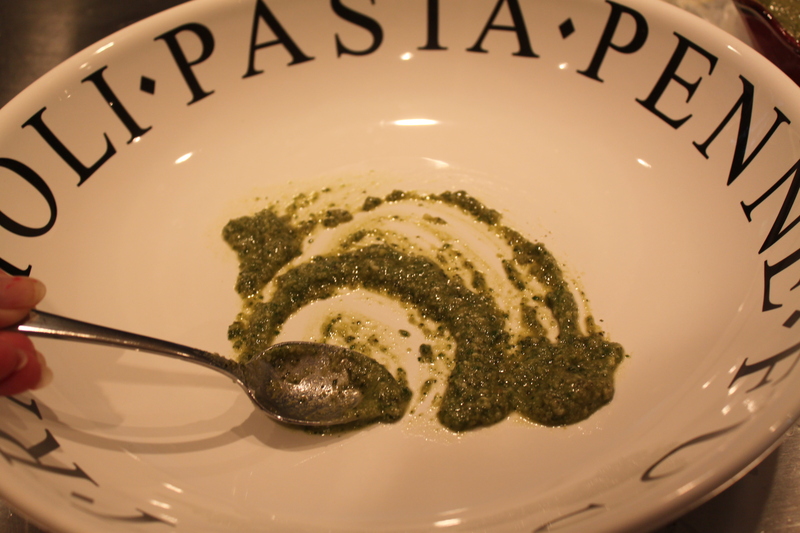 We also served the pesto on the side for those who want to add more to their dish. Sprinkle with Parmesan or Romano cheese and eat it up! 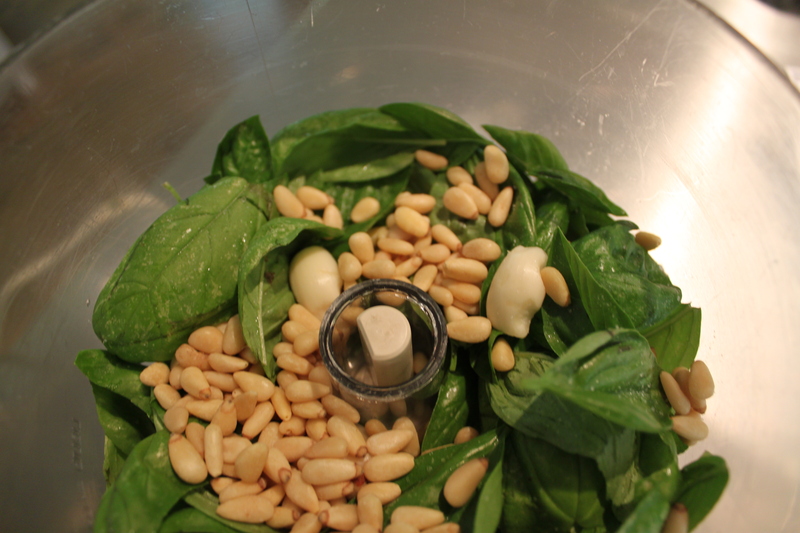 Place basil, garlic, salt and nuts in blender. Blend at high speed until finely chopped. Add oil in a slow steady stream. Can be frozen at this point. Add cheeses and blend until smooth. Refrigerate if made ahead. 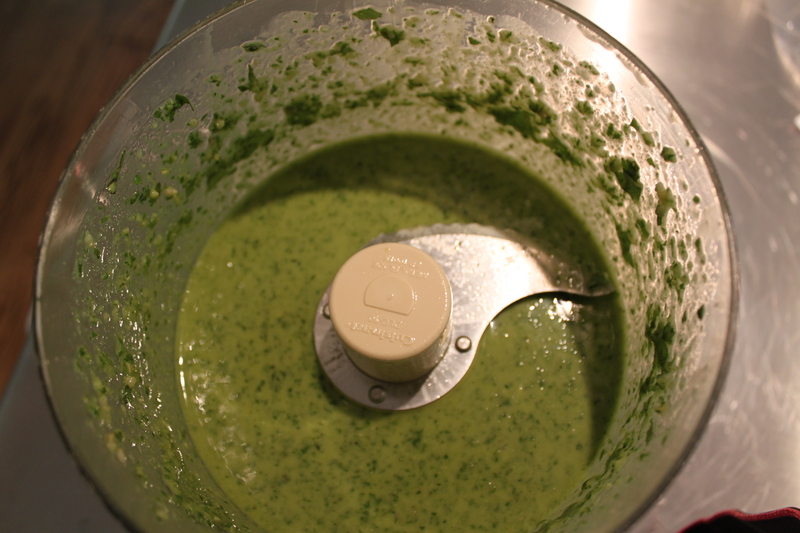 In heated serving dish, spread a couple of teaspoons of pesto in the bowl to release the flavors and coat the bottom of the bowl. 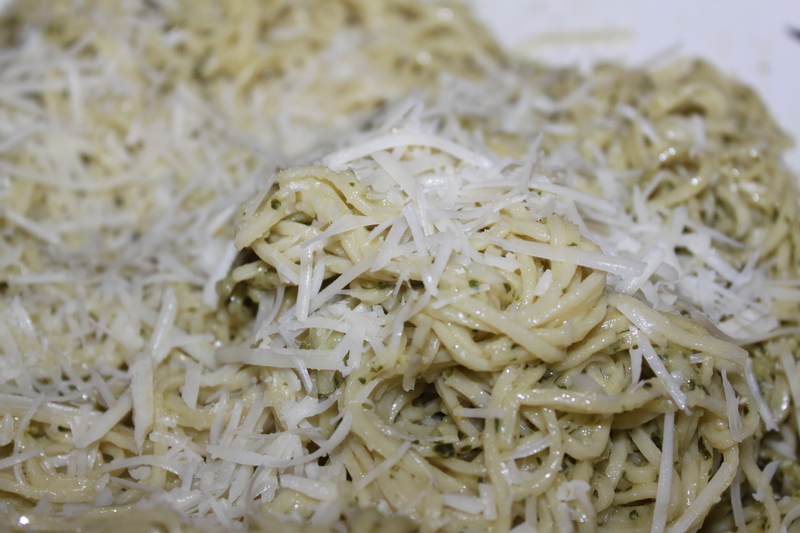 Toss warm pasta with basil mixture until thoroughly coated. Sprinkle with Parmesan and serve immediately.